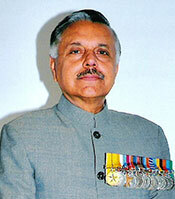 Lt General Kamal Davar retired from the Indian Army in 2004 after a most distinguished service spanning four decades. He has held coveted command, staff and instructional appointments both in India and abroad. For his distinguished services of the most exceptional order the Government of India awarded him the Param Vishisht and Ati Vishisht medals. A renowned operational soldier, General has served in all theatres of operations in India and was also wounded in action in the 1965 operations. His last appointment at Army HQ, for which he was especially selected by the Government, was as the ﬁrst Chief of The Defense Intelligence Agency (DIA) and Deputy Chief of the Integrated Defense Staff. During his tenure many intelligence initiatives were taken and widely appreciated by the government and the three Service Headquarters.